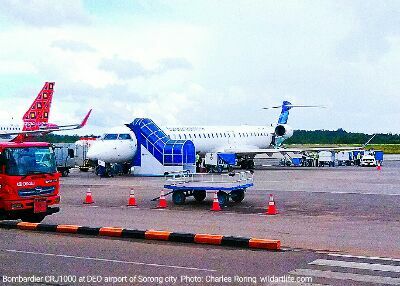 This is the picture of Bombardier Regional Jet CRJ 1000 airliner being parked next to Batik Air's Airbus A320 at Domine Eduard Osok airport of Sorong city. The CRJ 1000 aircraft belongs to and is operated by Garuda, a national flag carrier of Indonesia. The airplane has got very narrow body with two jet engines General Electric CF34-8 installed at the aft area of the fuselage. The engines have got 5:1 by pass ratio and a trust output of up to 14,510 lbf. Because of its slender body and powerful engine, the plane can travel faster. I often travel between Manokwari and Sorong or between Manokwari and Makassar. So, I choose Garuda to bring me to the destinations that I want. The passenger carrying capacity of this plane is 96 people with 12 Executive Class and 84 Standard Economy Seats. Sitting inside the plane when flying above the clouds, I can feel that the airplane is quiet and fast. Drinks and snacks are provided by flight attendants in all flights. Because the manufacturer use new materials and technology for making this aircraft, we can feel that their airplane is light and strong. Last month I went to Sorong city from Manokwari by the airplane. I felt that the flight was smooth and faster. It was a little bumpy when flying through clouds particularly while descending and approaching the airport. However, my overall flight experience with this aircraft was pleasant. Passengers who are tall sitting at the window seats have to be careful. When the airplane has landed at her destination, they have to be aware of the existence of overhead locker or stowage bin. Most often, passengers who are not aware of it may accidently bump his head on to the locker.